The first job today was to deal with the flood that ladysolly got in when the shower got blocked. I gave her Words of Advice on how to mop it up. 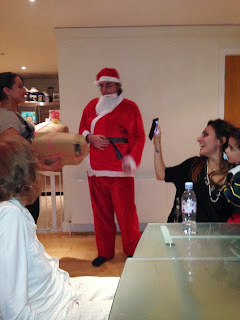 Then down to London by car to daughter.1 who was making Christmas lunch for all of us. When the time came to distribute Christmas presents, a very special guest appeared. Unfortunately, I was out of the room at the time, but apparently there was lots of "Ho ho ho" and "Who's been naughty?" before he vanished up the chimney to give a mince pie to the reindeer. I got two sweaters (one good, one for caching), a hoodie and more books than you might have guessed. Ladysolly got an iPhone 5C (among other goodies), which means I'll be inheriting her old iPhone 4, which is a lot more suitable for caching than the 3 that I'm currently making do with. We all ate far too much, and plan to do the same tomorrow, but at daughter.2's, but then on to daughter.1 for leftovers.